If you know me on FB and my other blog, you know that I’m a pretty honest person. Honest to a fault sometimes, I’ll admit. My mother would absolutely DIE if she knew I was going to post this picture, but I’m not her, and she’s not me. HA! I’m getting some work done. A while back, I posted about my trouble spot. It has bothered me since I was in college (maybe high school?) when it first showed up. It has made every decision for me in regards to pants that I’m going to purchase or wear. It has jiggled along with me on every run, every kickboxing class, and every TurboFire workout. Every morning, I look at it, sigh, and get dressed. Everyone who knows me knows it bothers me. One of my dearest friends met me for breakfast two weeks ago and said, “One more thing. I know you hate that “fat pocket” you have. I don’t think you need to do anything about it, but I know it bothers you. So I picked this up for you at the dermatologist the other day because your “fat pocket” is on the last page.” I couldn’t flip to the last page fast enough! And there it was! The gal in the photo had a dominant fat pocket (they actually call it that, it’s not just my term) on her right thigh, just like me! And after one treatment, it matched her other thigh! I was amazed. I was excited. I was hopeful. So… I called the next day! I went in last week and I knew then that I was for sure doing it! 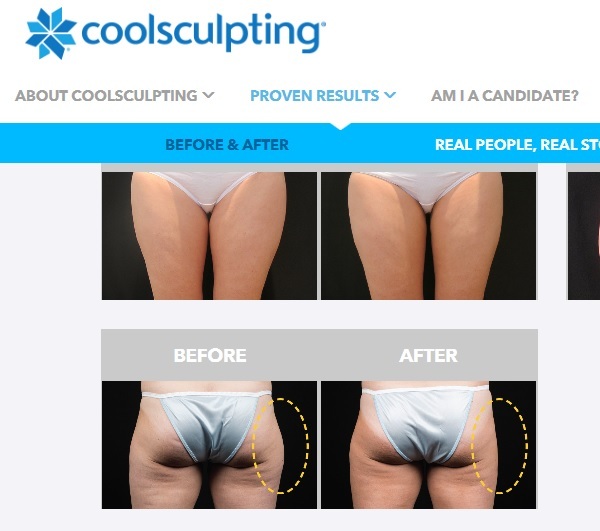 The gal who will perform the procedure (Coolsculpting) said that my body is what it’s made for – thin, in shape, toned but with little pockets of fat that you just can’t get rid of with diet or exercise. She said that if I was overweight, that it would not be the procedure to get me the results I want, but that because I’m the type of person it’s designed for, that I should be very happy. She, herself, did it 2 years ago on her upper belly and is 100% happy. So, for the price of $1,750 (it’s normally $1,900 but there was a discount this month), I get 4 hours of treatment, broken up into an hour each. So that would be an hour on each side, then another hour on each side 30 days later. 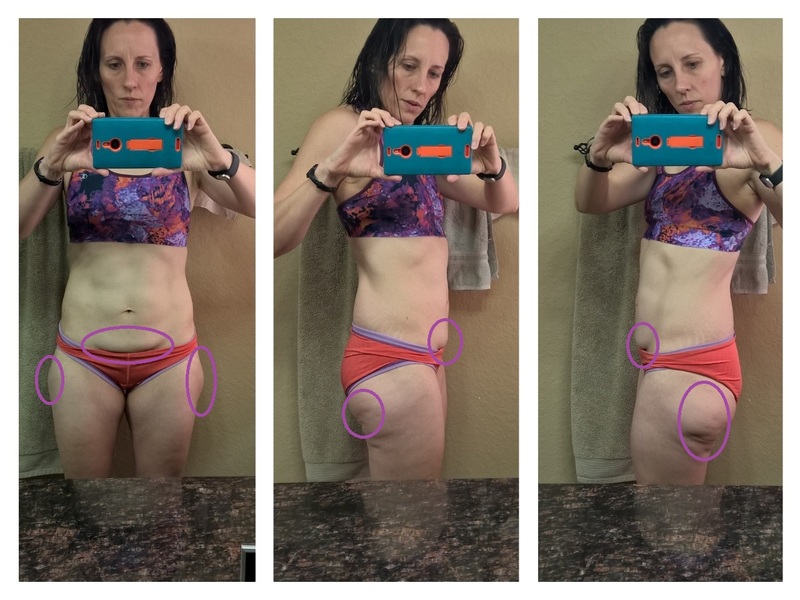 BUT – my right side is bigger than my left, so she wants to do both sides first, and then at the 30-day re-treat, do the right side again (to even my sides out) and use the remaining hour for my belly above my C-section scar. And… she says there’s not enough there to warrant a second treatment on my belly, so it should almost all flatten out. I walked out of there totally committed in my head that this was happening. But it is expensive (but not compared to invasive treatments like lipo or tummy tucks) and it wasn’t my sole decision to make. My husband and I went out for coffee the next day to discuss (he’d asked me to ask our dermatologist friend his thoughts first and he was 100% on board and said I’d be happy with it for my target areas) and he responded with, “book it, I am 100% supportive.” I was so excited! I told him that I was selling stuff furiously on FB to pay for it, but he said that I was being ridiculous and to just book it and get it done (he’s a great husband!). However, I’ve closed $975 in FB sales in 3 days and that’s all going to this treatment, because I can’t justify spending $1,750 of family funds on something cosmetic (my goal was to make at least 50%, and I’m past that!). So… it is happening on April 25th! I have a 2 hour session booked and the technician says I’ll see things start changing within a couple of weeks, but that the real change comes 4-12 after treatment. Four weeks after the first treatment, I’ll go back in for another 2 hour session and I’ll have the right side treated again and my belly treated at the same time. As she says, “it’s not like we’re cutting it off, we’re just flattening it out.” Whatever! Flatter is BETTER as far as I’m concerned! I, of course, will document this all here, because that’s what I do! Parts circled in violet are going to shrink! PS – I did start a new running program almost two weeks ago but haven’t had time to launch it here yet. I’m running 3 half marathons in 3 months starting on April 30. Lots of training going on! Two days ago, in another FB fitness group with thousands of members, a gal posted a picture of herself standing upright with flexed abs, and then a photo of her tummy when she bends over to show her child-bearing “pooch.” She posted it because she’s gotten lots of attention for her transformation and hard work, and she wanted all of the ladies out there to see that she has a “pooch” that will be with her forever unless she has surgery to remove it, which she has no interest in doing. I have also noticed that one of the gals in the Hammer and Chisel videos has the same thing as well as stretch marks on her tummy. I really appreciate that the program creators picked someone like her to represent us moms. A lot of the times, these exercise videos only include seriously hard-bodied people and I love that the BB team sees the value in including normal people in their videos. If you’ve seen a 21 Day Fix video, you know what I’m talking about. 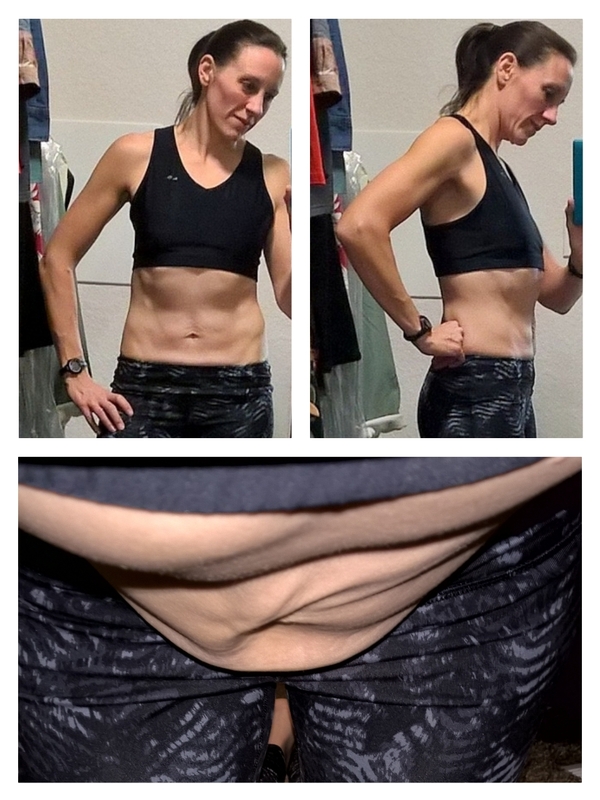 Look at that loose skin when I lean over… I hate it, but I can live with it! Trouble Spot – For Real! I read a good friend’s blog post today about exercise, and fitness, and trying to do better. In my comment, I mentioned my “trouble spot” that just won’t go away, no matter what I do, no matter what I try. 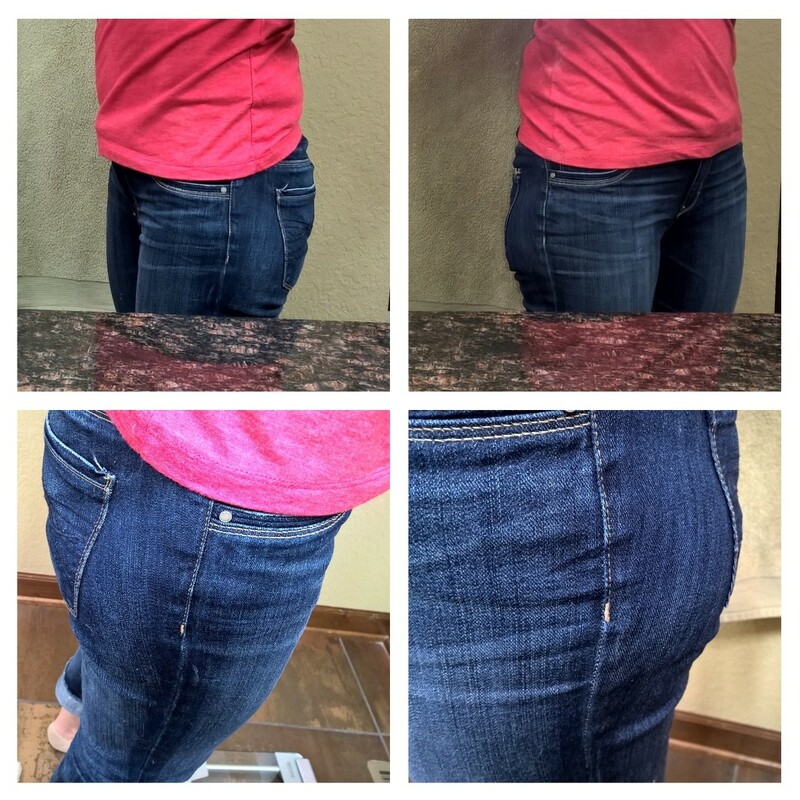 I’ve lost 40 pounds and it’s still there – the ONE saddle bag on my right side (the left one is almost all gone). I’m lopsided, and it looks terrible. The right one was always bigger than the left one, but now it’s like I have one and not another. I can’t wear normal bathing suit bottoms because it is so awful – I have to wear skirted bottoms (which I really like, so that’s actually just fine). 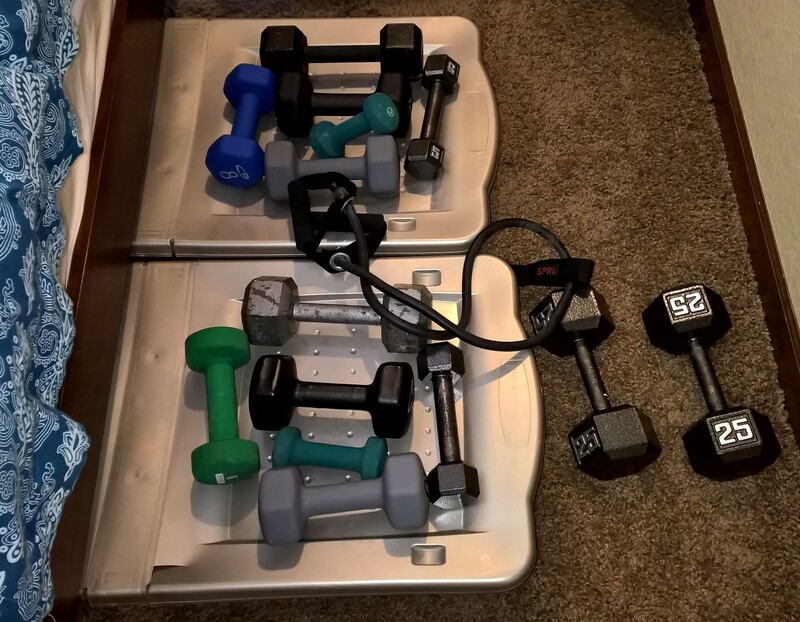 My collection of weights – I added the 5’s and 25’s just today.